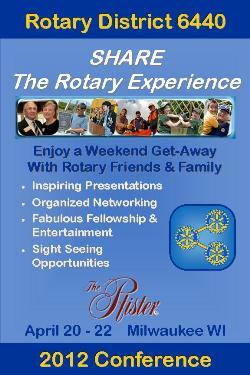 Whether you've been a Rotarian for 5 days or 50 years, our District Conference offers plenty of great reasons to attend. Sessions for all your committee chairs and officers. New and experienced members can learn about Rotary from A-Z. Meet Ambassadorial Scholars and hear how they are doing good in the world. Each club will be reimbursed for breakfast and/or lunch costs for up to 3 members attending the Assembly! Daniel Seddiqui tells his story of 50 Jobs in 50 States. Don Alhart, RI President’s Representative and PDG from Rochester NY, member of the NY State Broadcasters Hall of Fame. J.B. Pritzker, famed business leader and philanthropist. Katie Ehlis, charter member of the Rotary Club South Metro Evenings (Minneapolis) talks about attracting and engaging younger Rotarians. Jerry Mills, Rotarian and composer of “Come Join Us” and other inspirational songs, explains the secrets of greatness through words and music. 7. Get to know Rotary Youth Exchange Students and Group Study Exchange Team members to and from Taiwan and learn about foreign lands. 9. Discover new club project ideas and visit Rotary vendors at the House of Friendship and at the Innovative Club Project Awards presentation Saturday afternoon. 10.Two Great Parties- Friday and Saturday night, with dancing and fantastic music. Register Today. Savings Available until March 27.